Dimensions (HxWxD): 1.15" x 0.4" x 0.25"
This lovely natural, untreated, unpolished, double-terminated Hexagonal Brazilian Apatite Gemstone Pendant has a beautiful indigo blue coloration with hints of cyan. This little stone also exhibits traces of the matrix from which it was extracted on the surface of the pendant. This lovely Indigo Apatite gemstone pendant is set in a large, uncapped sterling silver bale, which allows the stone to breathe and makes it easy for you to pair this pendant with a silver chain, a leather cord or a fat silk thread of your choosing. Indigo Apatite is used by crystal healers for grounding and protection and also stimulates the flow of energy through the throat and third eye chakras, making this gemstone ideal for use in meditation, Reiki and rituals or ceremonies of all spiritual traditions. Apatite has a mid range hardness of 5 and forms hexagonal crystals which frequently appear prismatic, sometimes tabular & can be granular, compact & stalactitic. It is a phosphorous bearing mineral developing in igneous & metamorphic rocks. The colors of Apatite range from green, brown, red, yellow, violet, deep blue, pink, and even white to colorless with a vitreous appearance. It's name comes from the Greek word apate, meaning "deceit" because of the close resemblance & confusion with several other minerals such as aquamarine, olivine & flourite. This Indigo Apatite gemstone is a new variety for us which we recently acquired, and of course we had to try meditating with it to see what its metaphysical qualities are like. 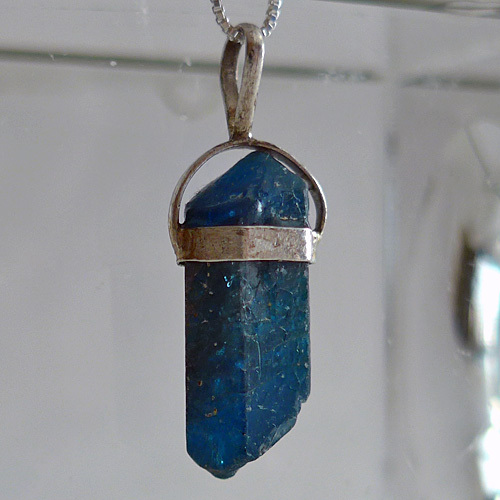 We find that Indigo Apatite Gemstones have an upper chakra influence engaging the crown, third eye & the throat chakra. Indigo is the color of the third eye chakra in the Western chakra system. In addition we find that Indigo Apatite has an affinity with the root chakra, very similar to the effect one observes with black tourmaline, which is really a dark, dark blue stone, not really black at all. 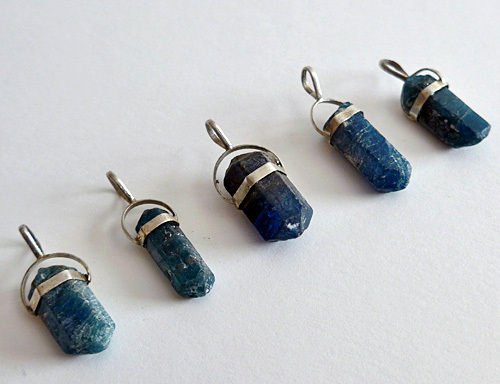 Thus Indigo Apatite provides grounding and protection as well as activating the throat and third eye charkas, strengthening the individual’s ability to apprehend and communicate psychic and spiritual insights. The throat chakra is considered to be colored blue in the Western chakra system, and the third eye chakra is seen as indigo. Jane and I are deeply impressed by the powerful healing energy generated by this natural, untreated, unpolished Brazilian Indigo Apatite, because of our personal experience with the stone in meditation and in use during Reiki healing sessions. When we use Indigo Apatite in Reiki sessions we find that it imparts a feeling of profound protection, deep relaxation and reverential quietude to clients seeking healing. We also use & recommend Indigo Apatite to those of you for whom sleep is an intermittant affair. Indigo Apatite promotes relaxation & gently eases the bearer into sound & deep sleep. Indigo Apatite soothes the soul, calms the mind, and relaxes the body. Indigo Apatite strengthens, stimulates and harmonizes the individual’s etheric, astral and causal bodies, releasing fears in a comforting energetic space, and providing for deep healing of long-held emotional and mental blockages. Simply wear this Indigo Apatite gemstone pendant during meditation, and feel the flow of peace and stillness spread throughout your aura, facilitating the cessation of mental chatter and the complete relaxation of the emotional body. You will then notice the feeling of relaxation and peace extending into the physical body as well. Over time, you will also notice a feeling of being grounded more thoroughly, as the Indigo Apatite connects with the energy stream flowing from the center of the Earth. The hexagonal faceting and good termination tips on this little gemstone adds a coherent energy so that one can feel quite focused, connected to spiritual guidance with ones heart & root chakra connecting to Higher Wisdom as well. Overall, the effect in working with lovely apatite is very grounding and imparts a wonderful healing feeling of connection between Divine Source, humanity & our Mother Planet. It also imparts a very solid connection to Life Force Energy & I would recommend this little gem to anyone for their meditation bag, altar bowl (see our gemstone bowls) or altar, bedside table or anywhere handy to use at any time of the day. It would also be an excellent stone for use during a Reiki self treatment or with a client or other energy work. This is a stone I would take for a walk in the city to keep me grounded & connected to Higher Wisdom. 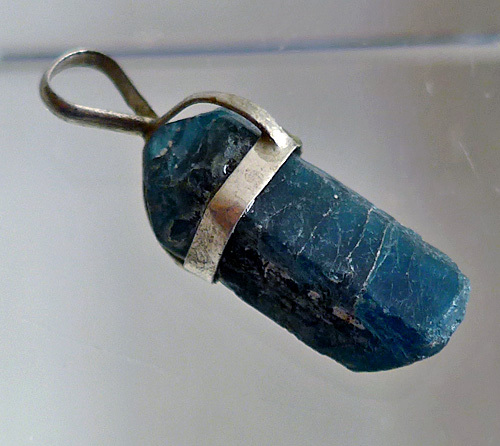 This Indigo Apatite gemstone pendant has been cleaned with Universal Life Force Energy, and given an energy attunement using Reiki, a Japanese technique of energy healing, so it will continue to receive and transmit Universal Life Force Energy direct from the Source of Creation. Note: weight above is shipping weight. Net weight is 3 grams. Each piece is unique & may vary in dimensions & appearance as you can see in the group photo above. Dimensions given at top of page are average dimensions. Each piece is guaranteed to be beautiful and to meet with your complete satisfaction and carry the wonderfully soothing Indigo Apatite energy signature.